DO get creative with what your dog carries. I highly recommend the pack Charlie has, the Ruffwear Approach Pack. It's kind of pricey, but it is really well built, comfortable for him, and has several pockets to carry items. It's also a good idea to bring a Dog First Aid Kit, but make sure you actually know how to use the items or replace items out with things your dog may need. For instance, I put extra gauze in there because most of the issues Charlie has had on the trail is cutting himself by a branch or from rocks. Super Glue is also a handy item, in case you need a quick suture. This depends on what the weather is going to be like, or how extreme it might get, for the days you'll be on the trail. It also depends on if you're dog likes to sleep near you or not. Charlie will not sleep outside the tent - he likes to snuggle too much and I'm not complaining about him providing some extra warmth. 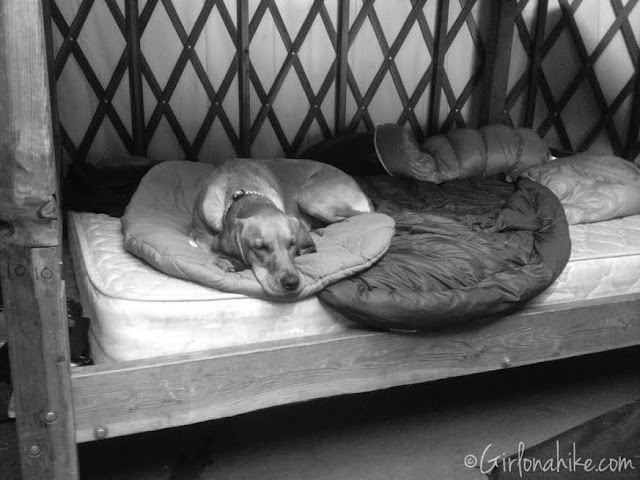 However, one of my friends never lets the dogs into the tent, and they sleep outside where they please. When Charlie and I backpack I bring his camping bed. If it's a really cold night, I will put his down coat on him. Where can I backpack with my dog? This depends what you live. Most State Parks require dogs on leashes and can do most trails; most National Parks don't even let dogs in the park. Sometimes they will allow dogs in on one or two trails, but not usually the popular, fun trails. The best type of area to backpack are the back country trails, which are usually on National Forest land. 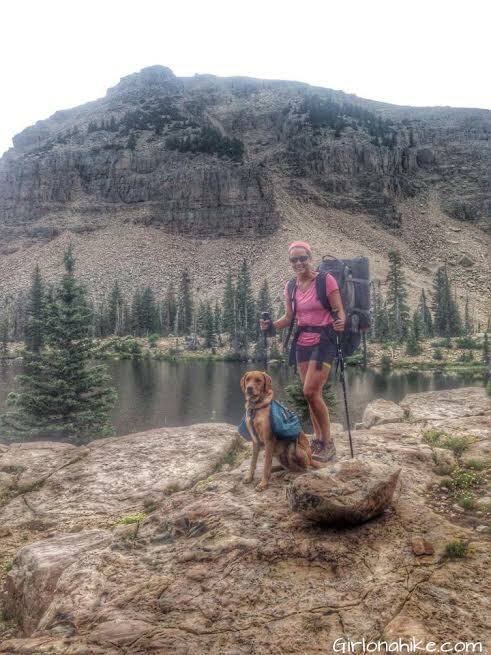 In Utah, the Uinta Mountains are perfect for taking your pup on an adventure because dogs can be off leash on all trails, plus it's free to camp. Click here to see a list of all the Utah National Forest areas. 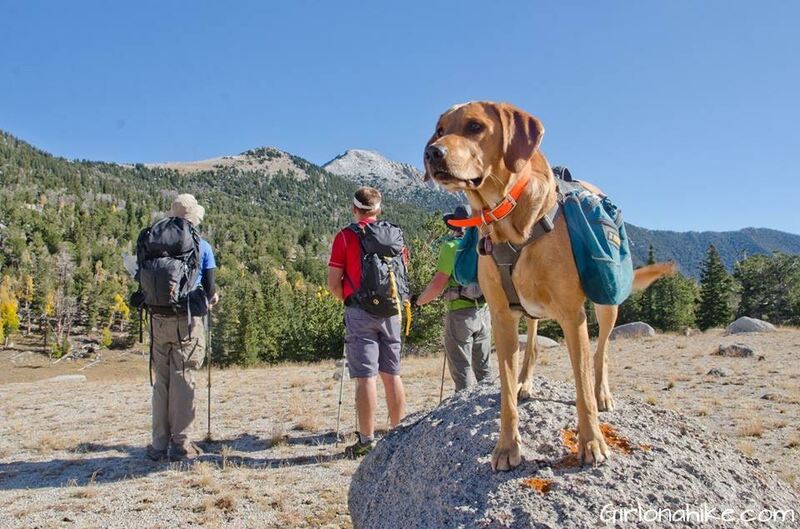 Be sure to check each trail to make sure dogs are allowed before heading out, and always carry poop bags in & out with you. 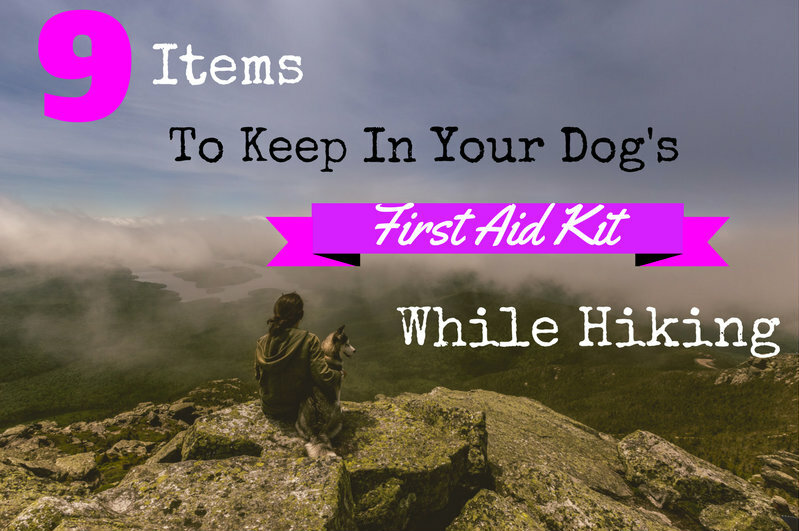 Check out these 9 Items to Keep in your Dogs First Aid Kit while Hiking and Backpacking! 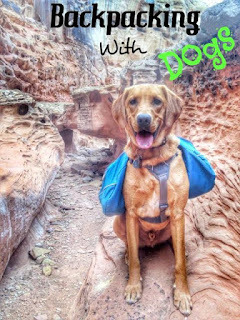 Charlie & I hope you have a blast backpacking with your dog! Was this post helpful? Please share, PIN, and post! Have any other tips or advice? Post it in the comments section below! Love the ruffwear packs! So durable! 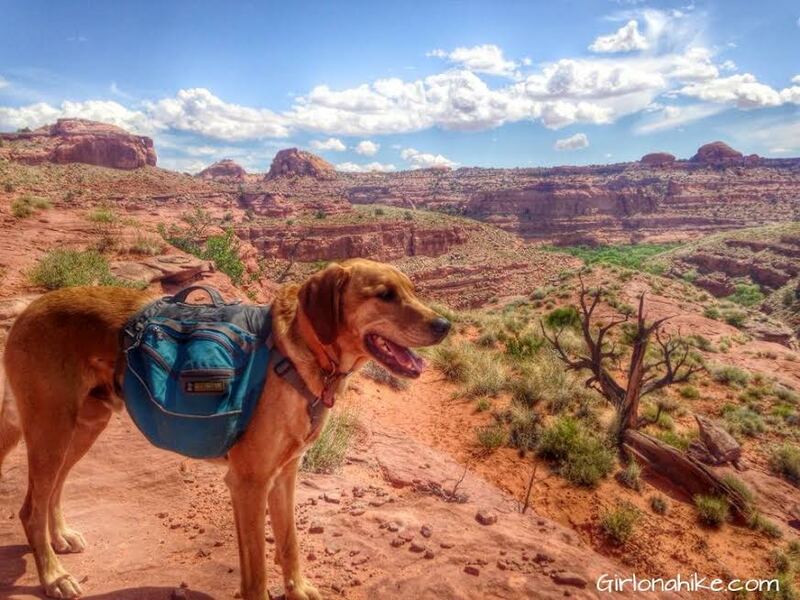 Charlie looks adorable sporting his pack around Utah :) I use mine when I want to slow Olive down, and to carry her stuff! The issue i commonly have is properly weighting both sides equally- it doesn't take much to throw it off when I am constantly taking water and other gadgets out of her bag. I have the same issue of making sure both sides are even weight. I keep a water bottle on both sides and alternate using them to keep it even, and that seems to help. Hi, I'm currently thinking about backpacking with a dog that I have yet to buy. Do u think that in the winter or snow, a dog should wear protective booties so his feet don't get hypothermic? I am wanting to take my dogs with me backpacking but the only time they've ever been off leash is in the backyard or the dog park. I'm nervous about 1) chasing after wild animals and then not being able to find their way home 2) seeing other hikers on the trail and going up to "bother" them and 3) attracting wild animals like coyotes or bears.. any advice??? 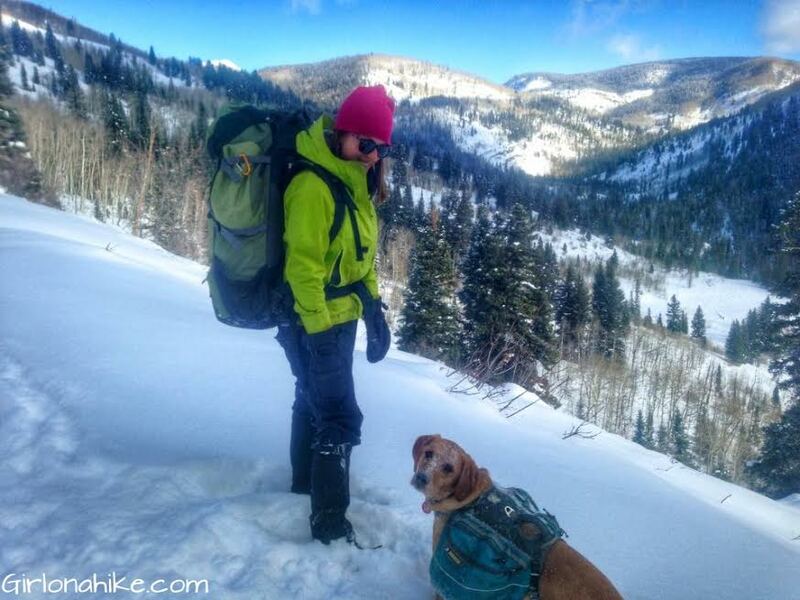 The Ruffwear Quinzee coat you linked to isn't a down coat. It's actually polyester filled. Just a heads up. Great post. I hike with my Labrador Retriever and use a very lightweight leash. I clip her when people approach, free her when we're clear. She isn't perfectly trained but will stop when I command (yell), even if its mid-squirrel pursuit. I recommend this very much as it may save the dog's life. Cementing SIT-STAY-COME whether they are by your side or across the street is enormous, and not hard (read Richard Wolters) I have found having my dog in my tent/camp while backpacking probably deters wildlife from approaching maybe due to her canine scent. I think moose and black bear may be less curious and more wary due to her scent being like coyote/predator. I still use a bear box though, and dont recommend keeping food near the tent/camp. We had a trail encounter with a large moose, we yielded the trail by moving well into the woods. The interesting part was the moose was looking at, and focusing on my dog the entire encounter. It was not concerned with me. Conditioning the dog's feet is great advice, and has worked for me. I will try the Musher's Secret though, thanks for that. Hi- I have a trip planned to coyote gulch around escalante. I also just adopted a dog. Is she allowed there? Where are the photos of your dog in the desert taken? Actually booties are really important if you are hiking a lot in the snow or if you are in desert conditions. Ruffwear did not invent dog booties. They've been around for a VERY long time. Im sure you wont be doing the iditarod any time soon but they are a requirement. Dogs feet are extremely susceptible to injury from cold or heat. You're right when you say they can build up a tolerance but only to an extent. Even asphalt on a hot day is very dangerous. Google paw pad burns or dog feet burns for some examples. 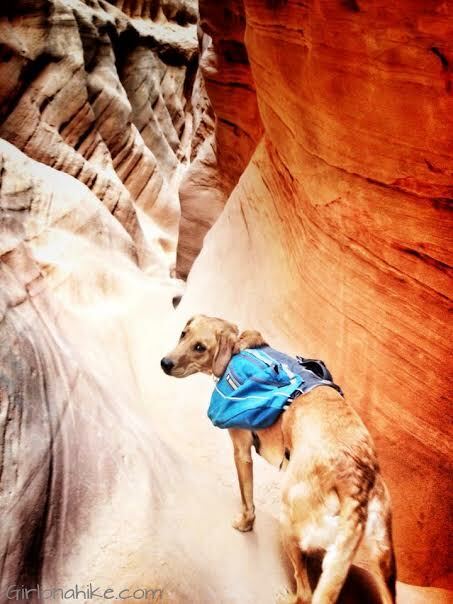 Hi there - where are those photos of your pup in the slot canyon taken? 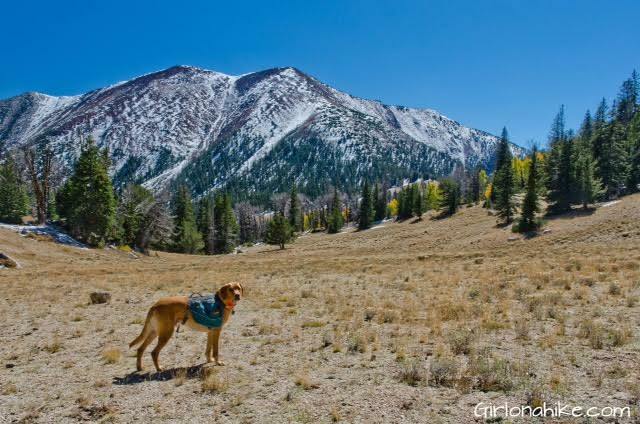 I want to head to Utah for some backpacking with my pup, and I'm primarily interested in canyon terrain. Something like Coyote Gulch or Canyonlands, but I know those places don't allow dogs. Thanks!